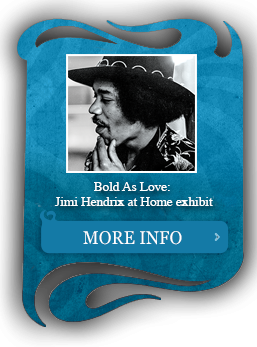 Freelance journalist, Sharon Lawrence interviews Jimi Hendrix in his room at The Beverly Hills Hotel. 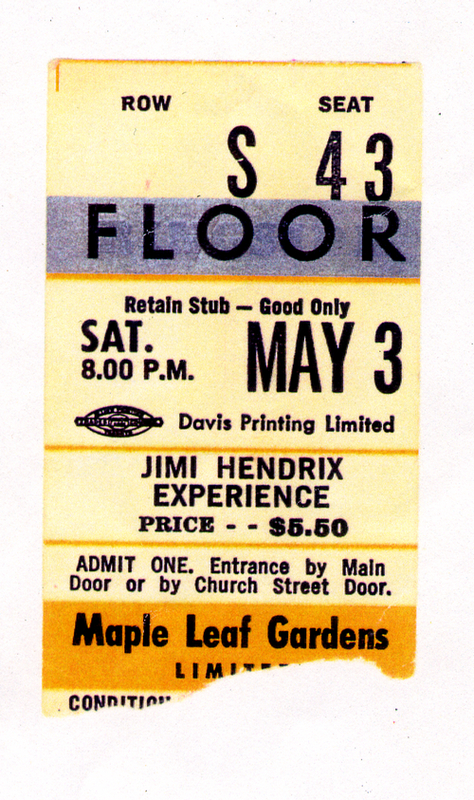 Maple Leaf Gardens, Toronto, Canada With Cat Mother & The All Night Newsboys Set List: Fire Hear My Train A Comin’ Spanish Castle Magic Red House Foxey Lady Purple Haze Voodoo Child (Slight Return) The Experience fly to Pearson International Airport in Toronto, Ontario and arrive at 9:30 a.m.. 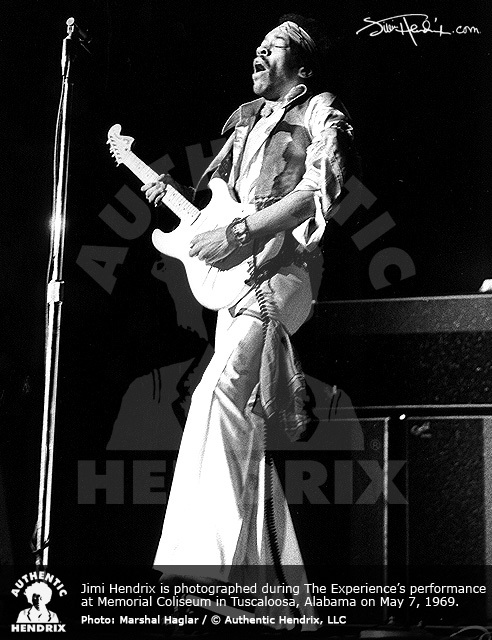 While checking through Canada Customs, one of the bags Hendrix offers to be searched contains what is believed to be an illicit substance. 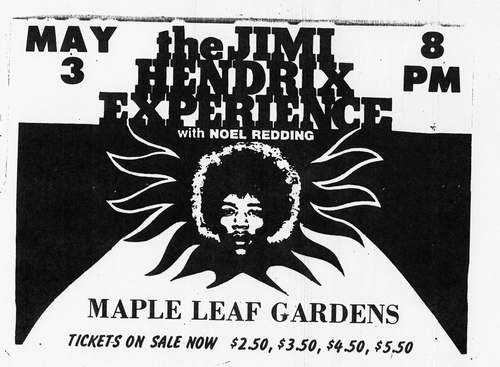 Hendrix is arrested and taken to Police Headquarters in downtown Toronto. He is later released on a $10,000 cash bail and required at a court appearance on May 5. 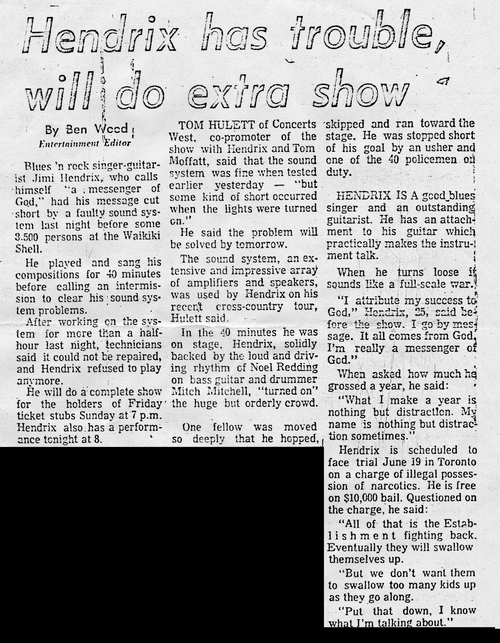 After his release, The Experience book into the Four Seasons Hotel and then head directly to Maple Leaf Gardens where they prepare for an evening performance. 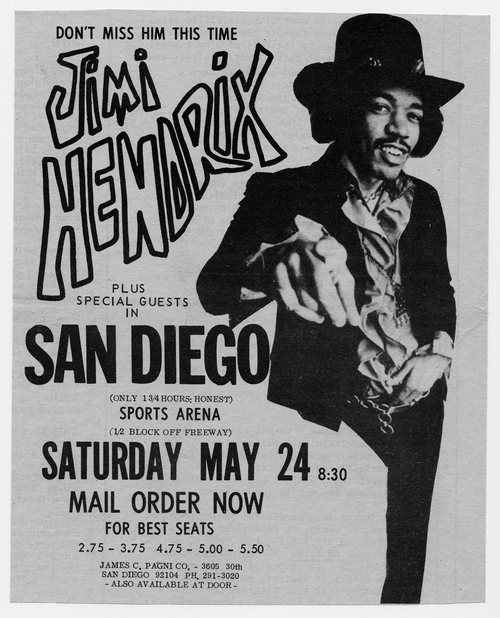 Jimi opened his show with greeting, “We want you to forget about today, about yesterday, and about tomorrow. 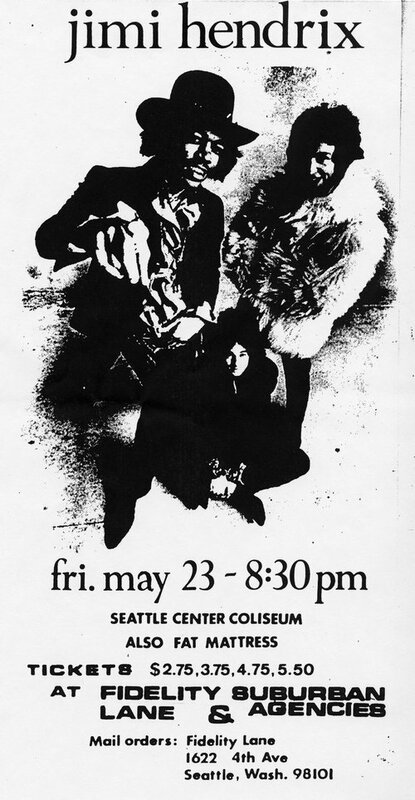 Tonight we’re gonna create a whole new world,” The guitarist then launched into an incendiary rendition of “Fire.” Ritchie Yorke, who reviewed the performance for the May 4 issue of The Globe And Mail, was moved to write, “his guitar became the voice of the Rave New World. 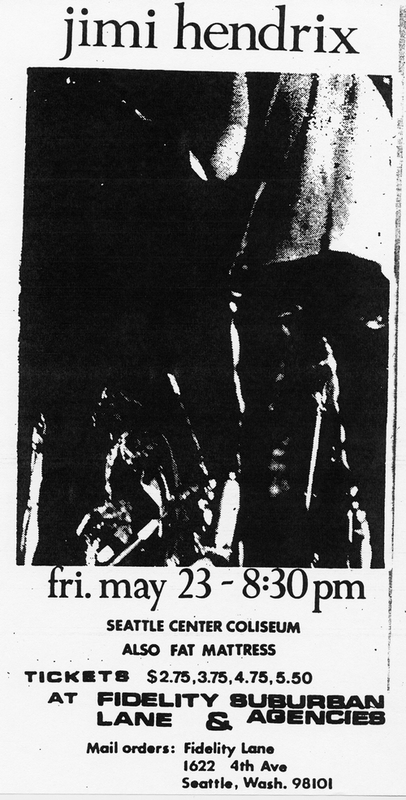 It screamed, hissed, and shrieked with the ferocity of a thousand dentist drills plunged into a single tooth.” The evening’s performance also featured a superb version of “Spanish Castle Magic”, complete with touches of both “Third Stone From The Sun” and “Little Miss Lover” interwoven within the song’s extended instrumental break. 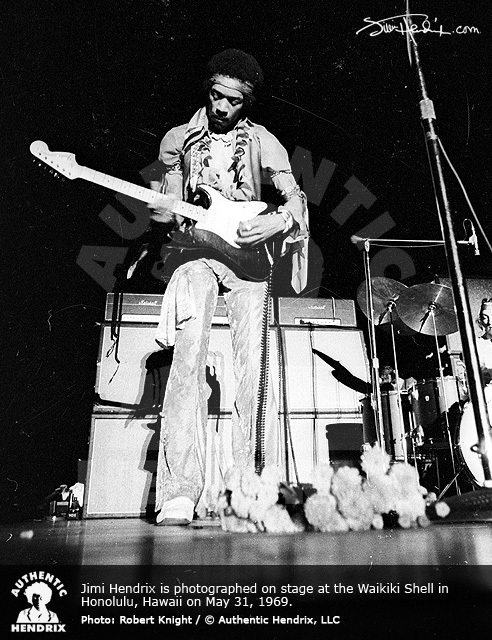 Jimi also performed a rare, fascinating early live version of “Room Full Of Mirrors”. 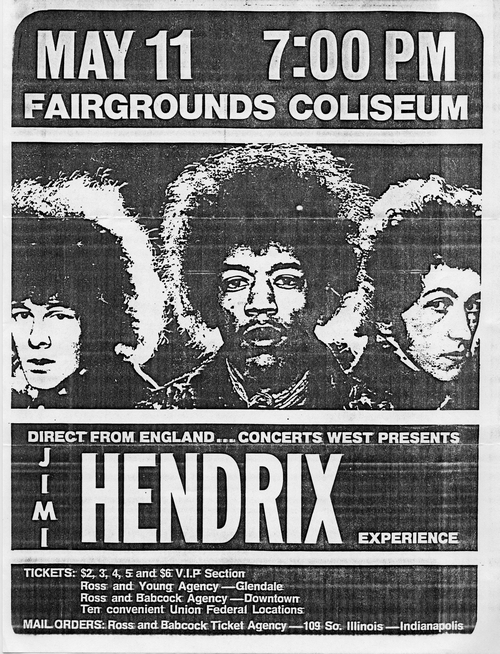 War Memorial Auditorium, Syracuse, New York With Cat Mother & The All Night Newsboys Set List: [partial] Fire I Don’t Live Today Stone Free Foxey Lady The Experience traveled from Toronto to Syracuse, New York. They secured lodging at the Randolph House Hotel before their performance that evening at the Syracuse War Memorial Auditorium. 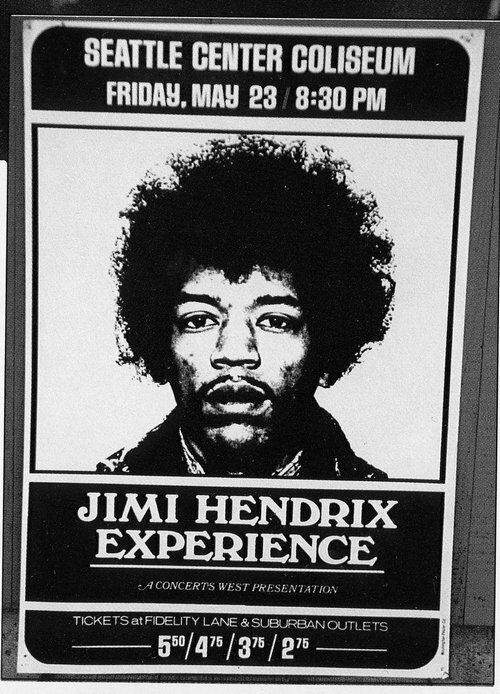 Jimi returned to Toronto, Ontario where he appeared in court before Judge Fred Hayes. 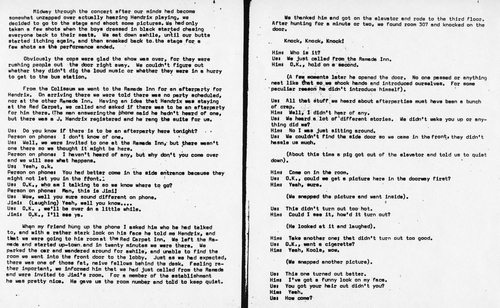 Hayes ordered Hendrix to return for a preliminary hearing for possession of narcotics on June 19. 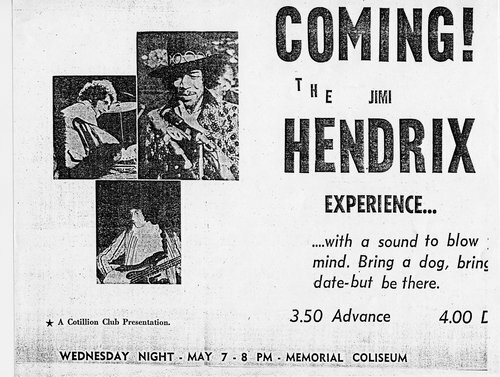 Photos of Jimi walking to the court house were later featured on the cover of Rolling Stone’s May 31, 1969 issue. Record Plant, New York Studio Recording Jimi returned to New York and booked an evening session at the Record Plant dedicated to playbacks of previously recorded material and mixing. 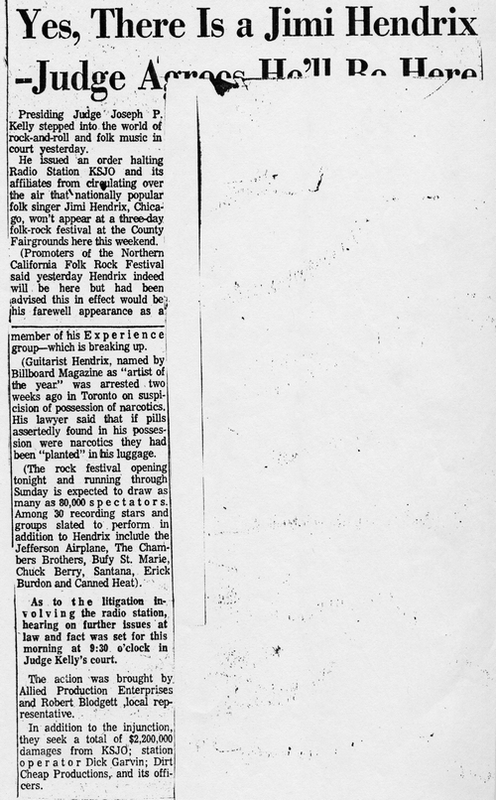 His session concluded at 2:30 a.m. and the guitarist left the studio to go to the Scene nightclub. 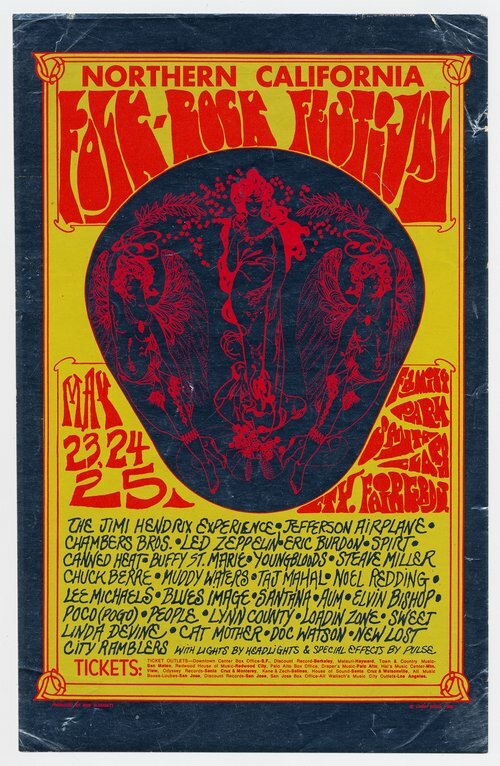 Charlotte Coliseum, Charlotte, North Carolina With Chicago Transit Authority Set List: [partial] Johnny B. Goode Fire Spanish Castle Magic Foxey Lady Red House Purple Haze Voodoo Child (Slight Return) Next on the tour itinerary is Charlotte, North Carolina. 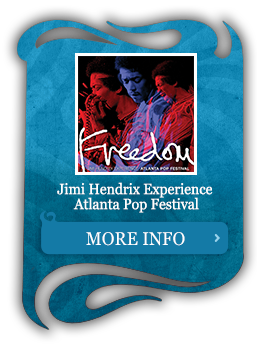 The Experience book accommodations at the Red Carpet Inn on 615 E. Morehead Street. 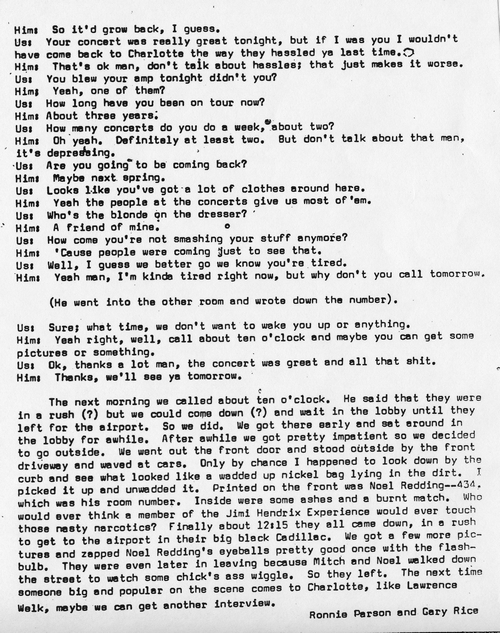 Once settled at the hotel, Hendrix is interviewed by Ronnie Parsons and Gary Rice for The Inquisition #3. 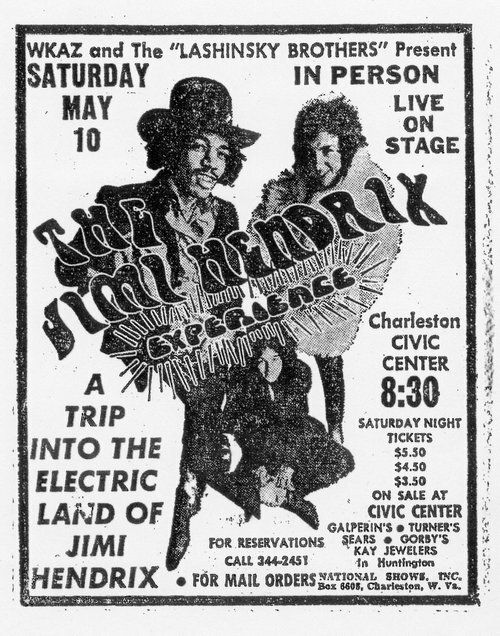 Charleston Civic Center, Charleston, West Virginia With Fat Mattress, Chicago Transit Authority Set List: [partial] Fire Come On (Let The Good Times Roll) Hear My Train A Comin’ Voodoo Child (Slight Return) Purple Haze Wild Thing The Experience arrived in Charleston, West Virginia and reserved rooms at the Hart O’Town Motor Inn prior to their performance that evening at the Charlotte Civic Centre. 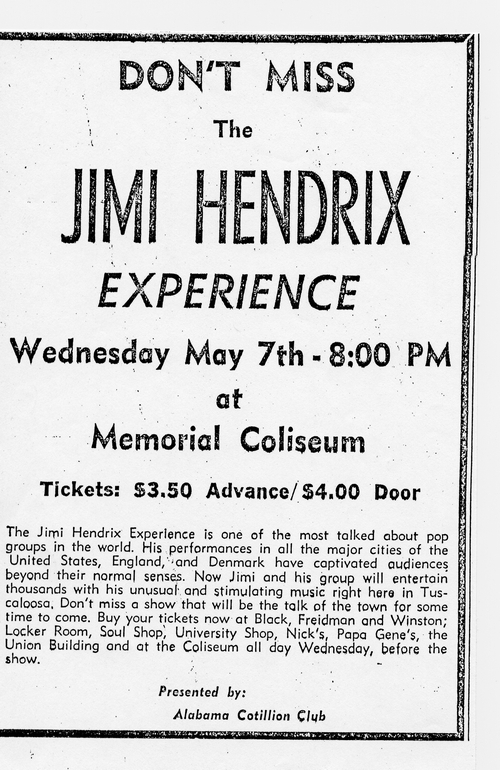 Following his performance, Hendrix was interviewed by Ray Brack for a Charleston Gazette article published the following week. Album Release Sunrise by Eire Apparent is released in England. 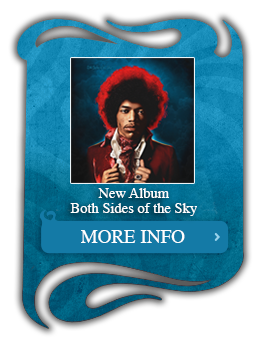 The album was produced by Jimi and features the guitarist making guest appearances on several tracks including, “Rock ‘N’ Roll Band,” “Yes I Need Someone,” “The Clown,” “Captive In The Sun,” and “Mr. Guy Fawkes”. Record Plant, New York Studio Recording 1) Keep On Groovin’ 2) Jam Session 3) Solo Demos A long evening dedicated solely to jamming. 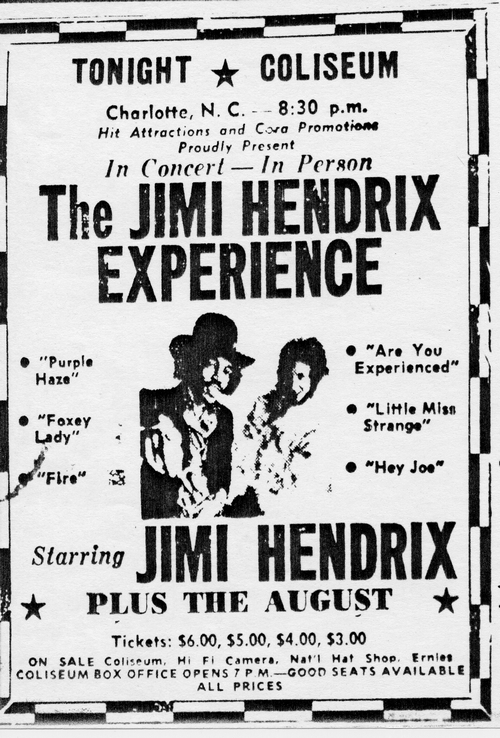 Jimi was joined by bassist Billy Cox, organist Sharon Layne, an unnamed percussionist, and a second guitarist known only as Sean. 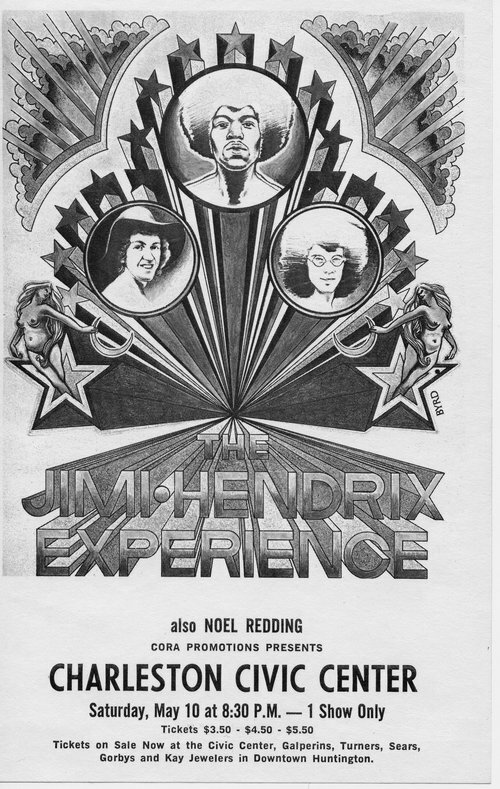 Record Plant, New York Studio Recording 1) Freedom 2) Jam 292 3) Untitled Jam 4) Horn & Piano Jam Backed by Mitch Mitchell, bassist Billy Cox, and organist Sharon Layne, Jimi recorded “Jam 292”, which was later posthumously issued as part of Jimi Hendrix :Blues. Later that evening, the group was joined by an unnamed trumpet player who contributed to series of untitled instrumental jams before the session concluded. 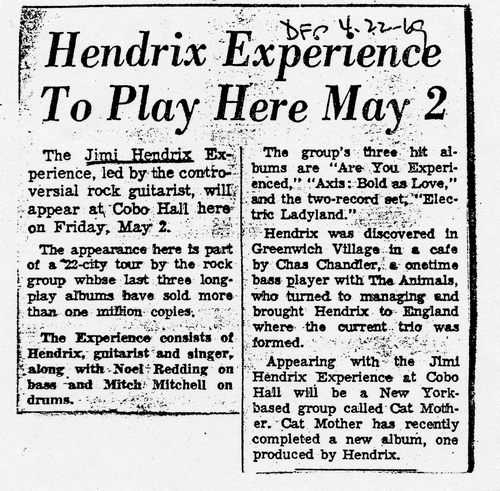 Record Plant, New York Studio Recording 1) Untitled Jam 2) Blues Jam 3) Instrumental 4) Stone Free 5) With The Power Of God 6) Slow Blues A marathon session at the Record Plant with Jimi joined by Mitch Mitchell, Billy Cox, Sharon Layne, and an unnamed trumpet player. 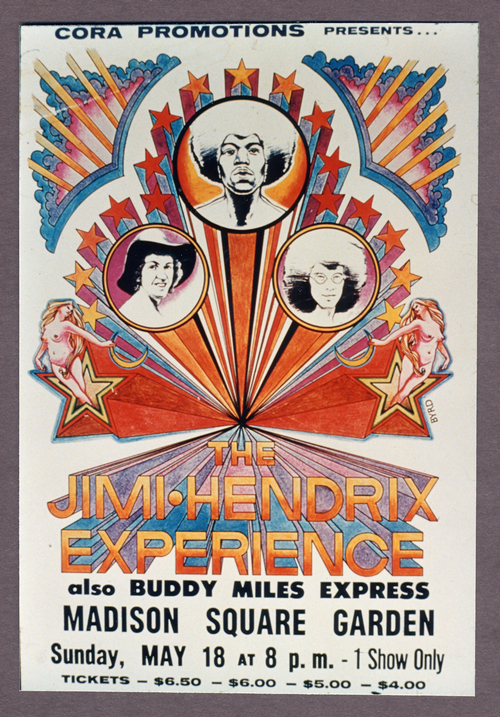 The group was also joined briefly by the horn section from The Buddy Miles Express. 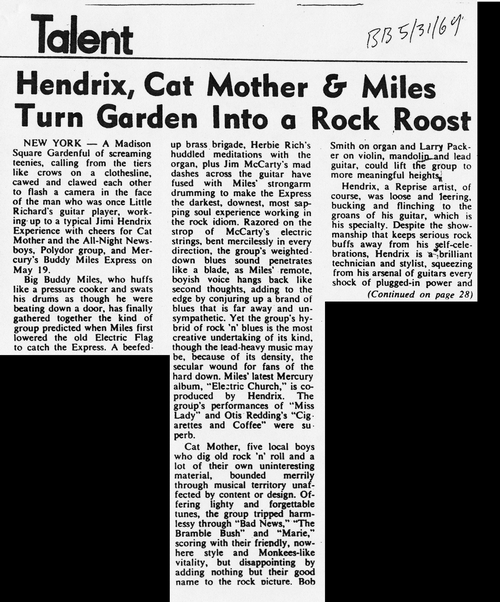 Record Plant, New York Studio Recording 1) “Stone Free” Instrumental takes with Billy, Jimi & Mitch In the early morning hours, Hendrix, Mitchell, and Cox recorded a number at attempts of a remake of “Stone Free”. No final masters were achieved however. 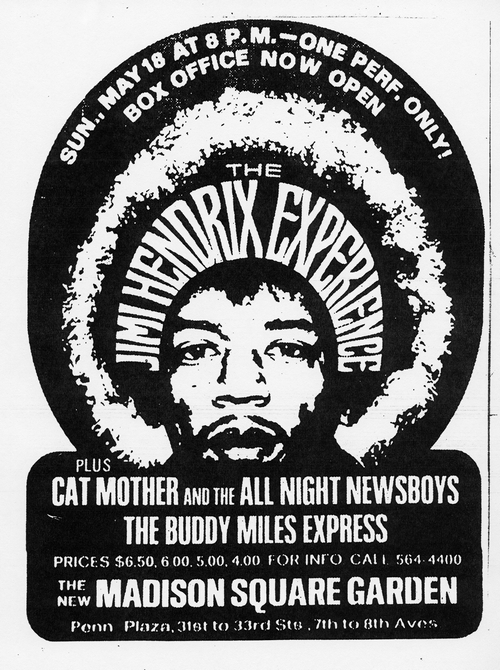 Baltimore Civic Center, Baltimore, Maryland With Buddy Miles Express, Cat Mother & The All Night Newsboys Set List: Lover Man Hear My Train A Comin’ Fire Red House I Don’t Live Today Foxey Lady Spanish Castle Magic Purple Haze Sunshine Of Your Love Voodoo Child (Slight Return) The Experience travel to Baltimore, Maryland where they perform at the Civic Center. Record Plant, New York Studio Recording 1) Hear My Train A Comin’ 2) Villanova Junction 3) Earth Blues 4) Untitled Blues 5) Jam With Buddy Miles On Guitar 6) Earth Blues 7) Bleeding Heart Jimi returned to the Record Plant to record with Billy Cox, Buddy Miles, and an unnamed conga player. 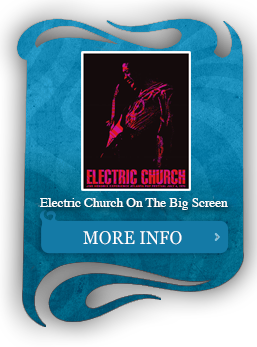 Over the course of this lengthy session, the group cut a superb rendition of the Elmore James blues standard “Bleeding Heart”. 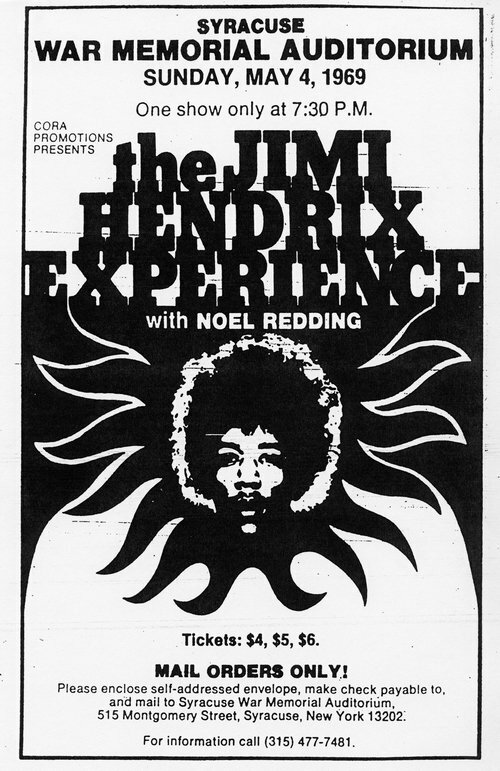 This recording was later edited and issued as part of Jimi Hendrix: Blues. Record Plant, New York Studio Recording 1) Message From Nine To The Universe For the second consecutive evening, Jimi was joined by Cox, Miles, and an unnamed percussionist. 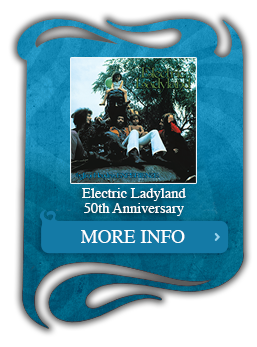 Their focus was centered on “Message From Nine To The Universe” an early hybrid of “Earth Blues” and “Message To Love”. A heavily edited version of this take was later issued as part of the [now deleted] 1980 compilation Nine To The Universe. Seattle Center Coliseum, Seattle, Wa. 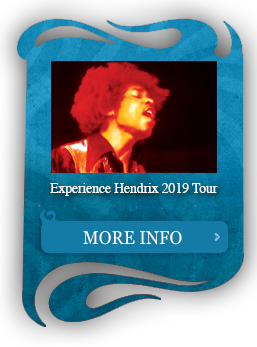 With Fat Mattress Set List: [Partial] Red House I Don’t Live Today Foxey Lady Purple Haze Voodoo Child (Slight Return) The Experience traveled to Hendrix’s hometown of Seattle, Washington. 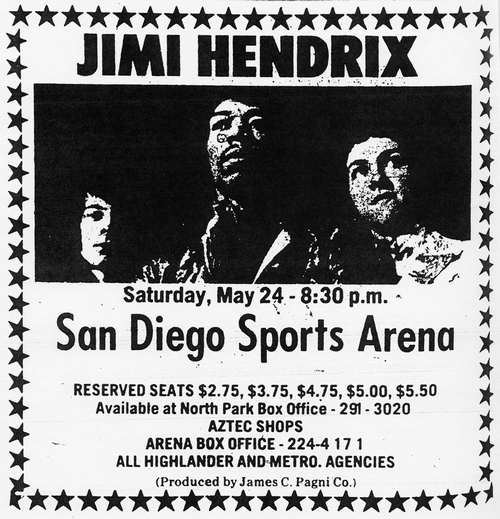 Sports Arena, San Diego, Ca. 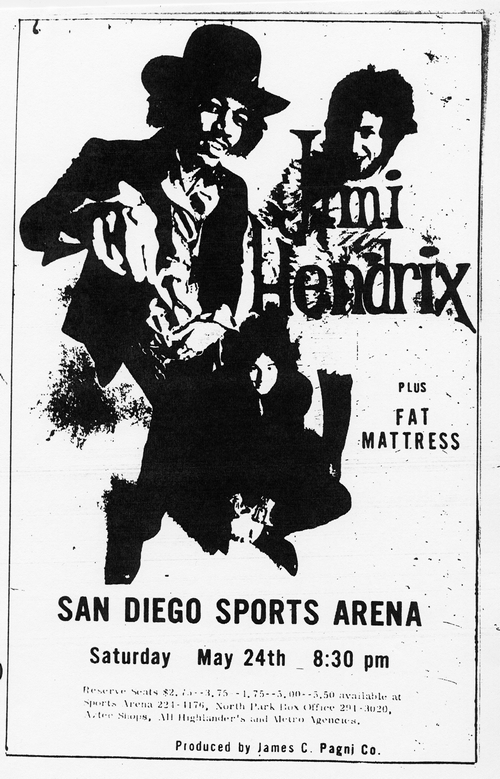 With Fat Mattress Set List: Fire Hey Joe Spanish Castle Magic/Sunshine Of Your Love Red House I Don’t Live Today Foxey Lady Star Spangled Banner Purple Haze Voodoo Child (Slight Return) A superb set which yielded some of the guitarist’s best loved live recordings. 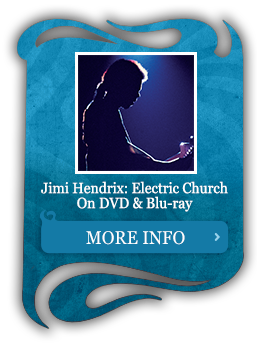 The recent box set The Jimi Hendrix Experience features two such examples, an exquisite, twelve minute rendition of “Red House” along with an incomparable version of “Purple Haze”. 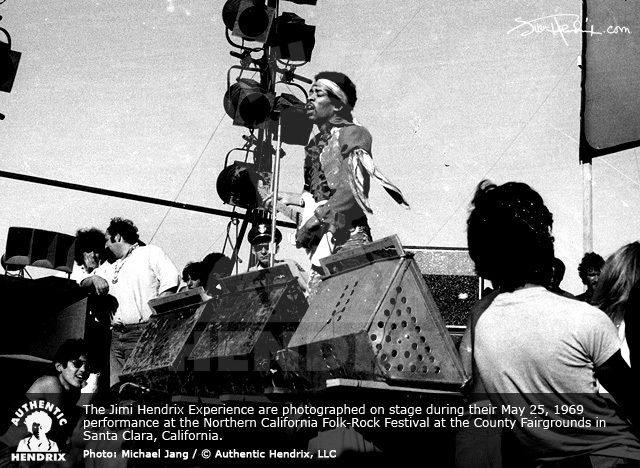 The Experience traveled from San Francisco, California to the Honolulu International Airport in Honolulu, Hawaii. 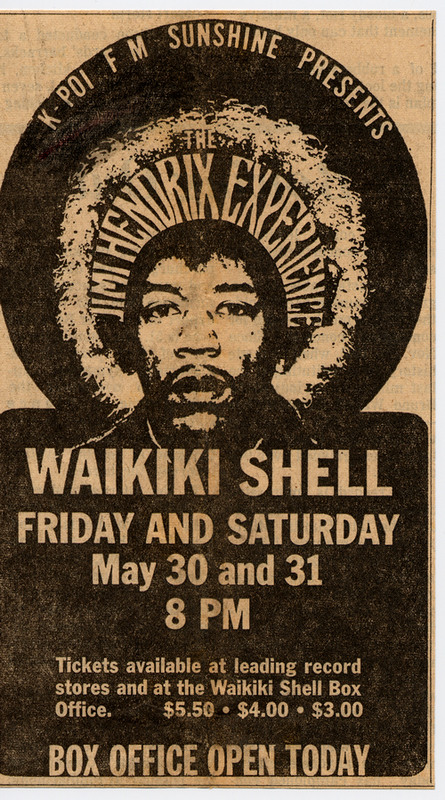 Waikiki Shell, Honolulu, Oahu, Hawaii With Fat Mattress Set List: [partial] Foxey Lady Red House I Don’t Live Today The Experience perform at Waikiki Shell in Honolulu. Due to technical problems with some of their amplifiers, the performance ends after only thirty minutes. 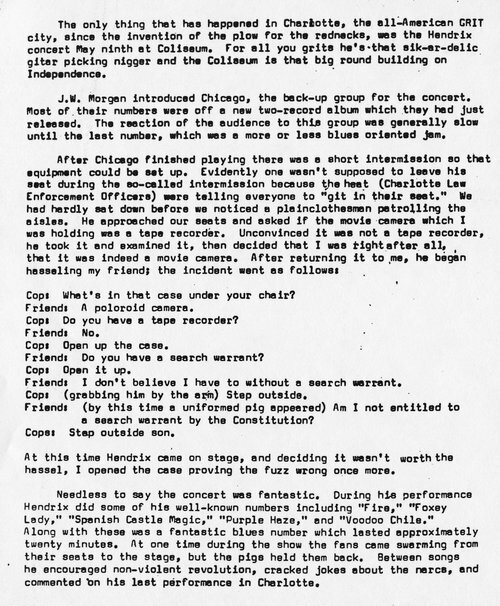 To placate the audience, promoters quickly agree to invite them back the following night or provided a refund. 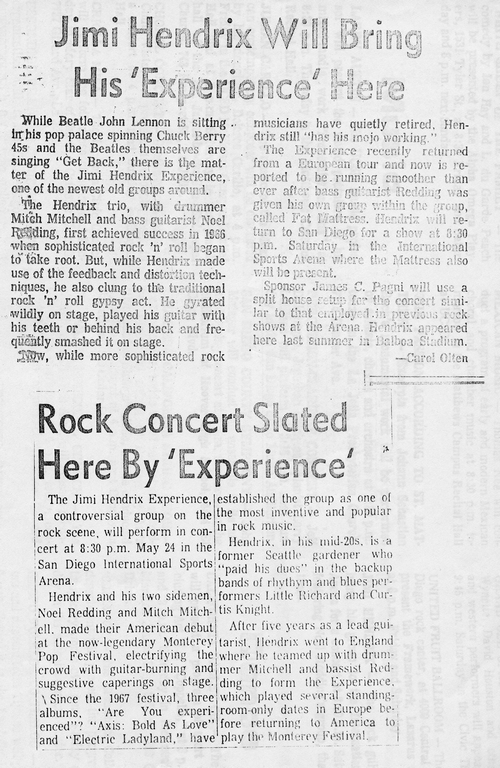 Prior to the performance, Ben Wood of the Hollywood Star-Bulletin interviewed Hendrix for the May 31 edition.